Like the idea of walk-in bath tub but hate the look? Fret no more! 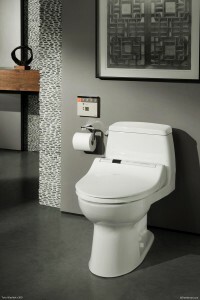 Kohler has raised the bar (so to speak) for accessible bathing with their Elevance™ rising wall bath. It’s designed so that you can easily sit down as soon as you enter the bath. It has a chair height seat, integrated grab bar – making it easy to get in and out of from a standing position, chair or wheelchair positions. The rising wall needs less than five pounds of force to raise and lower, the built-in foot well makes it easy to test the water temperature as well as lets your body recline – minimizing the pressure on your back and knees. The Elevance™ bath fills in 3-5 minutes and the dual drain system empties it in under 2 minutes. It fits a standard 5-foot alcove so it can replace an existing bath or used in new construction.